Leicestershire Fast Food Rights Campaign held its first day of action on Saturday 29th March. 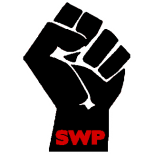 Involved in the protest for fast food rights were members of the BFAWU, Unite the Resistance, National Union of Students and SWP. 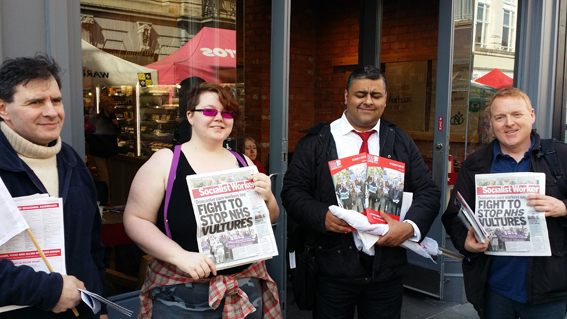 We leafleted a number of fast food companies which included Costa Coffee, Nero, KFC, Macdonald’s and Burger King. On the whole staff were either supportive of our protests for fast food rights or at least surprised and curious; they were unaware they had such rights. Leicester Fast Food Rights Campaign have distributed a model resolution to many of the local trade union branches and trades council. As the campaign builds we hope to involve more workers and students in activities. One idea put forward by a student is to leaflet and protest Student Unions as many students work in the fast food industry. This entry was posted on Mar 31, 2014 by leicestersocialistworkersparty in BFAWU, Fast Food Rights, NUS, Socialism and tagged communism, left-wing, leicester, politics, socialism, socialist, socialists.